The Indian Elite Men Winners at the PD Stage of the Airtel Delhi Half Marathon, 2017 (L to R) 1st runner up G Lakshmanan, Winner Nitendra Singh Rawat 2ndrunner up Avinash Sable along with Chief Guest Ajai Puri, Director-Operations-Bharti Airtel, Puma Legend Linford Christie and Anthony Ervin-International Event Ambassador. The 2017 edition of the Airtel Delhi Half Marathon lived up to its legacy of being the World’s most prestigious half marathon, with Procam International announcing and delivering a slew of initiatives to be able to provide athletes with a better running environment. The race turned out to be a bag full of surprises as favourites made way for new champions. The Indians had a fabulous race with Indian elites Nitendra Singh Rawat and L Suriya smashing the course records in their respective categories. Ethiopia’s Berhanu Legese crosses the finish line in 59.46 seconds to win the overall men’s title at the Airtel Delhi Half Marathon, 2017 on Sunday. Winner of 2015 Airtel Delhi Half Marathon Berhanu Legese repeated his feat on Sunday winning the Men’s Elite Category in 59:46. Making her half marathon debut, reigning 10,000m world champion and world record holder Almaz Ayana beat the women’s field with 1:07:11. Legese led Ethiopia’s 1-2 placing with compatriot Andamlak Belihu coming in five seconds later on his debut over the distance and American Leonard Korir came third clocking 59:52. 2017 IAAF World Championships Marathon gold medalist Geoffrey Kirui finished a disappointing sixth with a timing of 1:00:04. Delighted at his repeat feat, Legese said the weather conditions were perfect to go for the kill. “The weather was great, there was no issue at all. In fact the weather was favourable for a run like this. 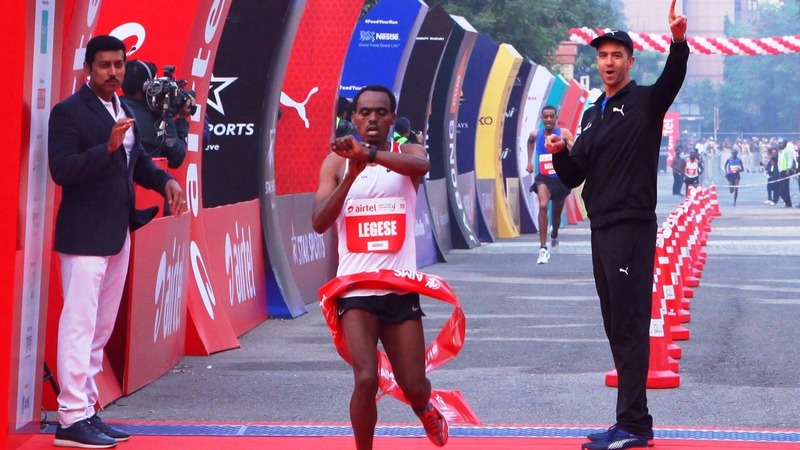 I would love to come back to Delhi to participate in the event again,” said Legese, who clocked 59:20 to win the 2015 Airtel Delhi Half Marathon. Honourable Minister of State (IC) - Youth Affairs and Sports Col (Retd.) Rajyavardhan Singh Rathore flagged off the race. 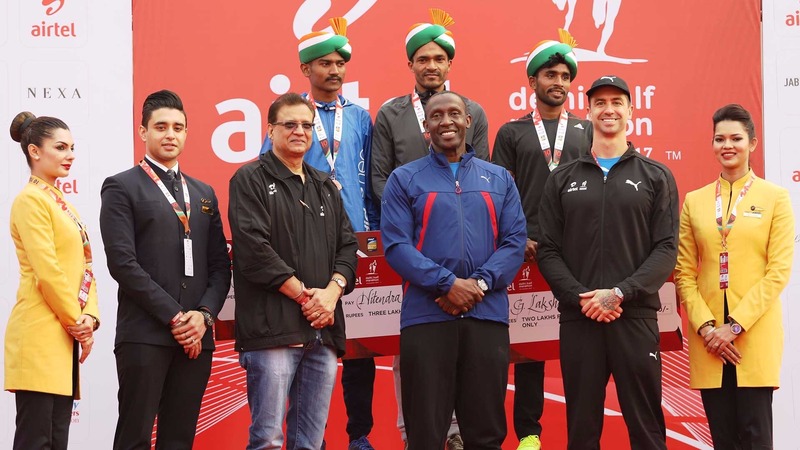 Airtel Delhi Half Marathon International Event Ambassador Anthony Ervin, PUMA legend Anthony Ervin and Honourable Minister of State in the Ministry of Parliamentary Affairs and Ministry of Statistics and Programme Implementation Vijay Goel were present at the event. Nitendra Singh Rawat took home the Indian Elite Men’s title beating defending champion G Lakshmanan in a thrilling photo finish (1:03:53). Rawat and Lakshmanan were neck-to-neck through the entire course. It was the last 100 metres when the real battle started as Lakshmanan and Rawat sprinted to the finish line. In what looked like Lakshmanan would go on and defend his title, Rawat pipped him at the post as his foot touched the finishing line before the defending champions. Avinash Sable came third with 1:03:58. Heading to the podium, Rawat, Lakshmanan and Sable also beat the course record set by Deepchand Saharan in 2009 of 1:04:00. Rawat said he had a point to prove by winning the race here. “I wanted to prove myself by winning this race so my strategy was to not take lead but keep going on until end. This win will prove that I belong to the national camp,” said Rawat while speaking to media. 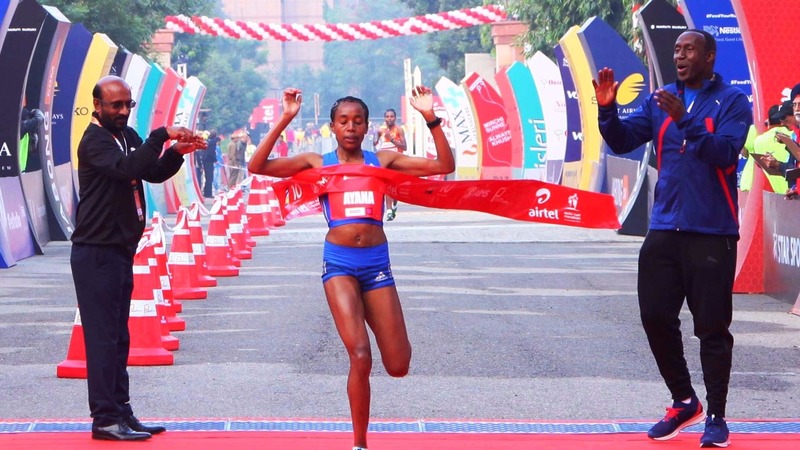 Ethiopia’s Almaz Ayana crosses the finish line in 1.07.11 seconds to win the women’s overall title at the Airtel Delhi Half Marathon, 2017 on Sunday. Reigning world 10,000m champion Ayana was making her debut over the half marathon distance but hardly looked like a novice as she led home an Ethiopian clean sweep of the podium positions in the women’s race. The outcome was decided in the final kilometre as she pulled away from her rivals. Ababel Yeshaneh was second again, as she was in 2016, and set a personal best for the second consecutive year as well, crossing the line in 1:07:19 to slice 33 seconds from her personal best. Completing the all-Ethiopian top three, Netsanet Gudeta also set a personal best of 1:07:24 to improve her best by seven seconds. Asked how she felt to win on her half marathon debut, Ayana said, “There were not many good track competitions so I decided to participate in this event. I always run to win, and this race too wasn’t different,” said Ayana. When asked if she would come back to Delhi after making a winning debut, “Yes, I will come back next year,” Ayana said at her post race interview. 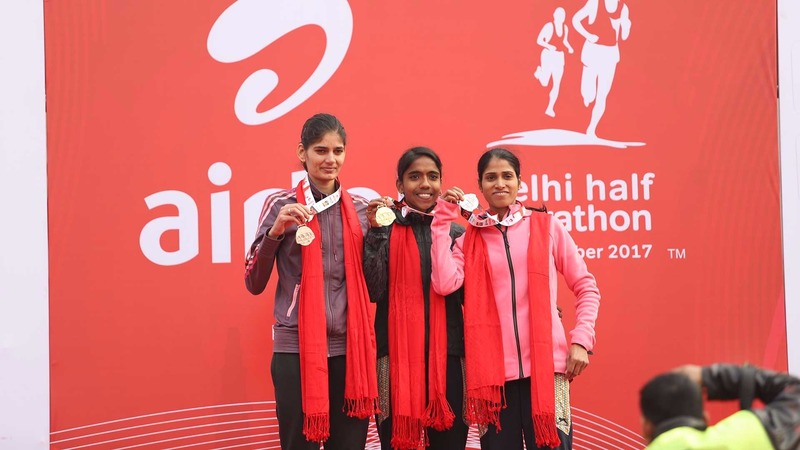 The Indian Elite Women Winners at the PD stage of the Airtel Delhi Half Marathon 2017 (L to R), 2nd runner up Parul Choudhary, Winner L Suriya & 1st runner up Sudha Singh). The Indian Elite Women’s category saw L Suriya clinching the top spot. “My coach Surendra sir told me to run my own race and maintain the pace throughout. I just did that but this wasn’t my best honestly,” said Suriya, who won the race by a minute. In the process, the 27-year old from Tamil Nadu set a course record with 1:10:31, beating Lalita Babar’s 2015 record at the event of 1:10:52. Her performance should be good enough to secure her a place on the start line of the IAAF World Half Marathon Championships in the Spanish city of Valencia next March, which would be her first global championship outing. Veteran Sudha Singh came second with 1:11:30 followed by Parul Chaudhary at 1:13:09. The winners got richer by US$27000 while runners-up got US$20000 and third-placed runners earned US$13000. First placed Indian Elite athletes earned Rs. 3,00,000 with runners up getting Rs. 2,50,000 and third placed runners winning Rs. 1,75,000. A course record jackpot of Rs. 2,00,000 will be shared amongst all three Indian Elite Men’s winners Rawat, Lakshmanan and Sable while L Suriya will have the entire sum to herself. Procam International expressed their gratitude to the Ministry of Youth Affairs and Sports, Government of India, Delhi Police, Government of Delhi and the runners of Delhi for their support and hands-on participation in ensuring the success of the Airtel Delhi Half Marathon held on Sunday. The mega event with a participation of over 34,000 would not have been possible without complete coordination and cooperation with the authorities. Almaz Ayana (ETH) 01:07:11; Ababel Yeshaneh (ETH) 01:07:19; Netsanet Gudeta (ETH) 01:07:24; Helah Kiprop (KEN) 01:08:07; Worknesh Degefa (ETH) 01:08:09; Paskalia Chepkorir (KEN) 01:08:46; Veronica Nyaruai (KEN) 01:09:02; L Suriya (IND) 01:10:29; Daria Maslova (KYR) 01:11:28 Sudha Singh (IND) 01:11:28. Nitendra Singh Rawat (IND) 01:03: 53; G. Lakshmanan (IND) 01:03:53; Avinash Sable (IND) 01:03:58; Durgabahadur Budha (IND) 01:03:58; Kalidas Hirave (IND) 01:04:07; Pradeep Singh (IND) 01:04:34; Abhishek Pal(IND) 01:05:42; Man Singh (IND) 01:05:46; Govind Singh (IND) 01: 05:49; Deepak Negi (IND) 01:12:48.